Do you tidy up before a cleaner comes? Two thirds of people in Britain do,* but you really don’t need to because, according to the new crime detecting heroine you can tell a lot from even a clean and tidy house. 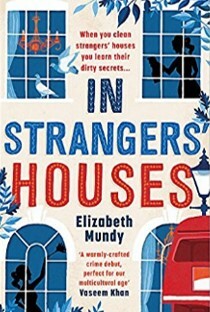 The heroine of “In Strangers’ Houses” is Hungarian migrant Lena Szarka who has been living in London for several years with her amiable Polish boyfriend Tomek. Their life introduces us to a circle of people who have left an unhappy country in the hope of a better life in another, and who do the jobs often associated with that process. Tomek is an Uber taxi driver, Faisal distributes newspapers at an underground station and Lena, and her friend Timea, work for an agency supplying house cleaners. Refreshingly, Lena enjoys her job, deriving satisfaction from the visible difference her work makes. She is happy cleaning both for those who are clean and tidy and those who are not. In the reverse of estate agent values however, she prefers modern anonymous blocks of flats with their straight walls, carpets and easy surfaces to the dust producing floorboards of the older town houses of Islington, where “In Strangers Houses” is set. Sometimes Lena and Timea know the people whose premises they clean – the fraught mother of toddlers for whom their visit is a breath of sanity, the Belgian political lothario, or the lonely old lady with a pet rabbit - but Lena prefers working in an empty home without the obligation of conversation. Timea is a softer character, happier engaging with people and she allows herself to be drawn into the lives of those for whom she works. This is the background to the mystery which is triggered by Timea’s disappearance. She was the orphaned daughter of neighbours in the always unnamed village in Hungary where they come from, and Lena induced Timea to join her in London so feels responsible for any trouble she may have got into. Timea lives with Lena and Tomek, but Lena begins to think that Timea is keeping secrets from her so when Timea doesn’t come home one night, Lena raises the alarm. Lena believes the answer lies in one of the houses on Timea’s list so she starts working through it, in addition to her own. In each of them she finds a different story: a love nest, an anonymous base for those who eat only takeaway food, a pied-a-terre, a family home. And then there are the more sinister dwellings – gang hideouts perhaps, or fronts for smuggling. Lena tries to weave the information she gleans from each of them into some sort of narrative in which Timea might figure and which might explain what has happened to her, but it seems that each of the threads leads elsewhere. Can Istvan, another emigrant from the Hungarian village, who jilted Lena for a life of television stardom, bring his fictional detective expertise to help? And just whose side is he on? Determinedly on Lena’s side is policeman Cartwright whose novel approach to detection is based entirely on statistics, probability, percentages and past patterns. In an unusual attempt to help her he draws up complicated charts to analyse all the data she gives him. How often are cleaners and their clients found to be in cahoots, or more importantly, at odds? And which is it for Timea? Lena and Cartwright pursue several leads but it is not obvious which will take them beyond the premises in question. Will they be thrown off track by the unimportant before finding a resolution to the mystery and the path to a new situation for each of them? I thoroughly enjoyed this book and found it both involving and teasing. I would have preferred a little less naming of products: a MacBook, Pledge, etc. which found me whispering under my breath “other cleaning products are available”. There were some slightly implausible elements but I did not guess the solution which is always satisfying in a crime mystery novel. I will certainly look out for the next in the series, promised later this year, but of course now I have to go and tidy up before anyone comes to clean my house!